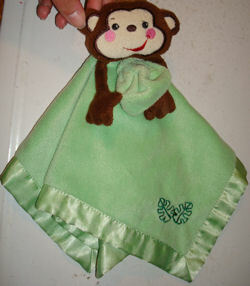 I am looking for the Fisher Price Rain Forest green blankie with a brown monkey in the middle. My son had decided that this was to be is best friend and sleeping buddy. However, our dog decided that it would be a really great toy to destroy. I had a very traumatized child when he found bits of “Monkey Man” scattered around our house, but I assured him that he was just probably lost, and we would find him soon…as of a week in no such luck on finding him. on top of a $50 diaper cake. Asking the seller if they have any extras or would sell the monkey seperate. seller said she would list without the diaper cake. Thank you so much. I have a feeling that I will be in a bidding war with someone as there is already a bid on it! Wish me luck. Thank you for your help! the bid is a little high but I know how it is I used to have a baby blacket that the dog got a hold of as well. My son has the same Fisher Price green blankie with the Rainforest brown monkey in the middle. It's starting to fray and I'm desperately seeking another one. I was curious if you had any other luck finding that monkey security blanket in addition to ebay? I search ebay regularly, but have not found the same lovey blanket. danamarloweAThotmailDOTcom and I hope you have a great day! If either of you are still looking? Feel free to give us an update on search progress. Yes I am still looking. I have been outbid on a few of them in the last few seconds. Thank you for continuing your search! Have you tried calling Fisher Price I have called them and gave them a product number before and sometimes the still have it is stock. I had to do that with a piece for a baby swing and a net for a basket ball goal. Thanks, 20574! I realized we had several asking for help finding it who never sent me a story, so I made a mailing list and notified them all. Thanks, Carrie. The list was down to one, so with this many found I have discontinued the search for this one. hello, this was my little brother’s favorite toy and he recently lost it at the Dollar store – he is 2 and we are desperately seeking another one! if anyone knows where we can find one….